Côte review – fine French food for everyone? Can a chain do French bistro food justice? With only a few exceptions, I don’t really like chain restaurants. They may have the best of intentions, bringing consistently reliable food to a large number of people at a reasonable price, but as the number of franchised branches balloons, the quality of the food tends to slowly slip downhill. I therefore approached my business lunch at the Soho branch of Côte with some trepidation. Côte is a large chain of French restaurants with branches dotted all over England and Wales, but with a large concentration in London. The decor is supposed to be based on those of classic French bistros, but it failed to leave much of an impression on me. The Soho branch was bustling at the time of my weekday lunchtime visit, but despite this the service was friendly and efficient. 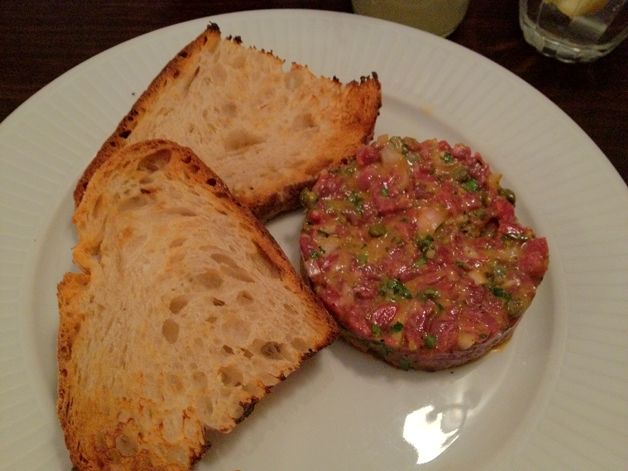 I started off with the steak tartare, a classic dish and one of my culinary obsessions. Côte’s version is slightly chewy with an offaly flavour as well as some sweet and peppery hints to it. It’s a surprisingly good rendition of this French classic, although the chopped hanger steak sometimes available at the nearby Duck Soup is an even better raw beef dish. Sadly, the roasted sea bass wasn’t nearly as accomplished. 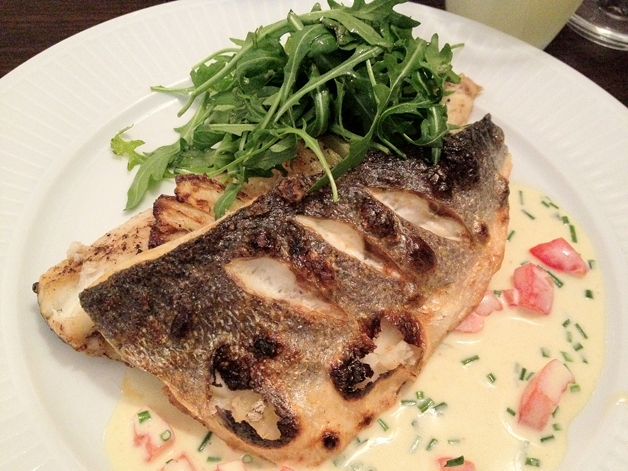 Although the skin was crispy, the fish flesh was far too soft and flaky. I wasn’t enamoured with the rather bland, creamy sauce or the limp rocket either. This sort of thing might pass muster with the tourists, but it just isn’t good enough for the rest of us. ...unlike this fish out of water. None of the desserts tickled my fancy, so I opted for the cheese selection to finish my meal. I was unimpressed by the rather bland sample of Reblochon, a soft, unpasteurised cow’s milk cheese. I was positively insulted by the rather shoddy slice of Comté. It was far too immature with a one-dimensional creaminess and none of the layered nuttiness, subtle sweetness or the crunchy saltiness of the very best mature Comté. It was very rubbery too. The only saving grace was the Roquefort which was pungent and strong, although the acidic tang wasn’t quite as pronounced as the best Roquefort I’ve had. Must try harder. I don't mean to grape, but really? My meal at Côte started out so promisingly with a surprisingly decent steak tartare, but it quickly went downhill from there. The slapdash cooking of the roast sea bass was bad enough, but the poor quality of the cheeses, where no cooking is involved, showed an alarming lack of taste and discretion in the procurement of finished foodstuffs. Côte may have long opening hours and be reasonably priced, but the latter is a false economy and unless you’re really pressed for time or can’t get in anywhere else, you’re better off avoiding Côte. Bringing French bistro food to everyone is a great idea, but not when it’s done like this. Opening Hours: Monday-Wednesday 08.00-23:00, Thursday-Friday 08:00-midnight, Saturday 09.00-midnight and Sunday 09.00-22.30. Total cost for one person including coffee: £30 approx. 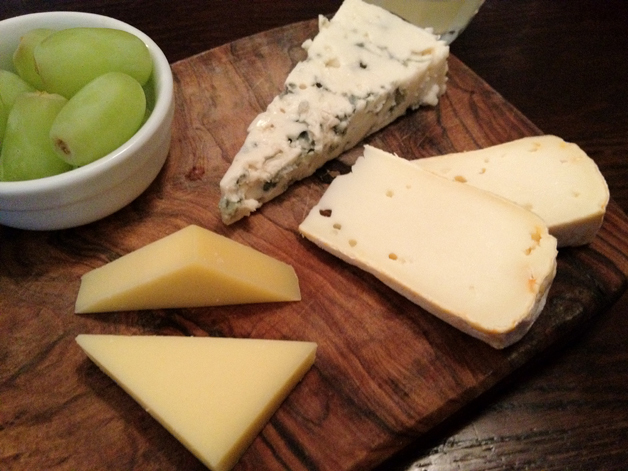 Tags: cheese, cote, london, restaurant, review, rocket, sea bass, steak tartare. Bookmark the permalink. I’ve been to Cote (in Soho) a few times and found it more than acceptable. As it’s a chain I think you have to accept that the decor isn’t going to wow you or that you are going to find dishes that knock your socks off. Everything I have eaten there has been decently cooked, the portions are generous and the pricing is reasonable. Perhaps you are looking for something that you’re never going to find in a place like that or unfortunately got a bum dish but there’s nothing that offensive about it and compared to 99% of chains and I think they should be credited for that (which may sound perverse but that’s chains for you). I will agree that there are lots of amazing places to eat in Soho that are much better but I wouldn’t steer clear of the place especially when places like Pit Cue make you wait hours and have front of house that seem to sneer at you for turning up at 6.20pm expecting to be told exactly why I am queuing to get in to queue again. I am not sure why I feel the need to stick up for them but I suppose it might have something to do with having to endure a fair few bad meals in chains or bad restaurants that friends insist on booking and Cote never really offends or to be fair astounds (even thought they did once serve up a more than passable veal schnitzel that was bigger than my face). Now if you want to review a truly objectionable chain masquerading as a restaurant try Ping Pong! I wasn’t expecting haute cuisine from Côte, but reliable ‘good enough’ versions of French bistro classics. The problem is that not only were they not ‘good enough’, at worst they were just plain bad meaning there’s little reason to eat there repeatedly – especially given the multitude of alternatives in London in general, and Soho in particular. I might be willing to eat at a chain branch if I’m stuck somewhere in the provinces with no other alternatives, but certainly not in a place with lots of other options like Soho. Even worse, the bad or middling quality of Côte’s food could dissuade people who don’t eat out very often from exploring French food further. That really would be inexcusable. Visited local Cote (Esher Surrey) two days ago. What a disappointment. Food bland. At the table to my right the gentleman sent his mains back. The lady at the table in front of me sent her mains back. £51 for chicken and chips twice – basic starters – no afters. One glass of wine and a bottle of Perrier. One limp side sallad between us. Much better chicken and chips and with lots of flavour (if thats what you want) at Nandos. Returning tomorrow to get my money back – could not make a fuss with my wife present.